This past school year the San Diego Workforce Partnership (SDWP) formed a unique partnership with the Vista Unified School District (VUSD) to provide meaningful experiences for high school students to help prepare them for the world of work in a new CONNECT2Careers program called C2C on Campus. Opportunities like career guest speakers, job shadows and internships provide students a firsthand look at the world of work with the intention to help students discover their talents and passions and begin to plan for their futures as employees in their communities. 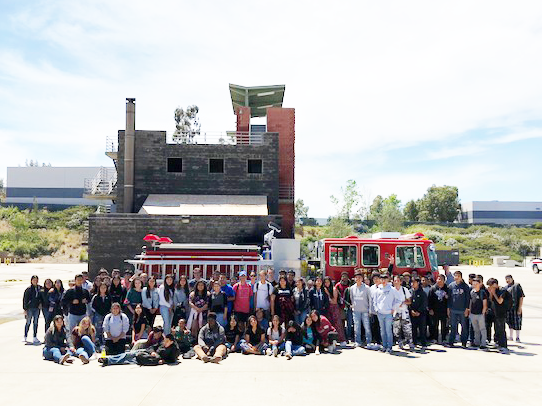 One of many opportunities provided this past year to Vista Unified students included a job shadow day at Palomar College’s Fire Academy in San Marcos. 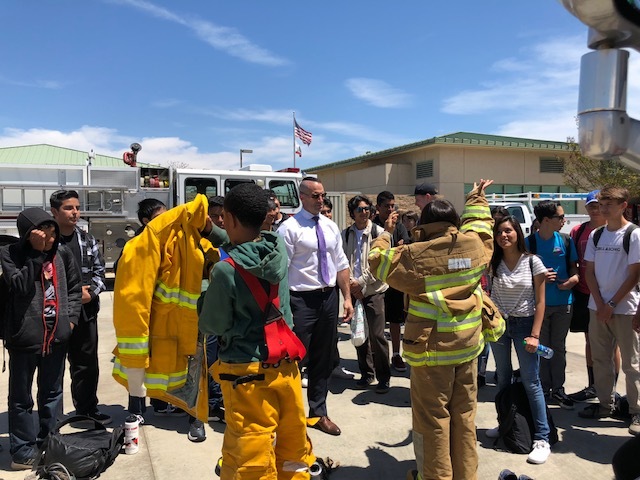 There, ninth grade students learned what it takes to become a firefighter. During this experience, students discovered various careers in the firefighting industry. Students were given an opportunity to watch current recruits in action by observing them training with ladders and hoses and got to see a fire truck up close. They even got the chance to put on some of the training gear used by the firefighters. An emphasis on volunteerism and giving back to one’s community was stressed as an important consideration when determining who will be accepted as a recruit to the academy. For student Frankie, having this opportunity was of great personal significance to him because he has wanted to be a firefighter since he was 4 years old. Frankie’s excitement in being at the Fire Academy was evident. “I got to talk to one of the recruits and he helped me with finding out how to get more involved with the academy,” he says. “There’s been a spark in them where I can see them actually enjoying this and actually seeing themselves maybe as a future firefighter and EMT one day,” shares Connelly. This is just one example of an opportunity offered by partners like the Fire Academy to the students of VUSD this past year. SDWP looks forward to continuing our collaboration into the new school year to provide many more valuable experiences similar to this one to ensure students grow to be successful adults ready for the world of work.